The Roundtable Meeting on South Asia’s economic integration discussed trade, investments, trade facilitation, connectivity, and other building blocks of South Asia Economic Union (SAEU). Member countries of the South Asian Association for Regional Cooperation (SAARC) requested the Asian Development Bank (ADB) to undertake a study examining the extent of regional cooperation and integration already underway in the region, and prepare a “Roadmap for Achieving SAEU (Second Phase)” study. Ms. Lakshmanan Savithri, SAARC Director for Trade and Finance and Mr. Hun Kim, ADB Deputy Director General, South Asia Department, opened the meeting. Mr. Hun Kim in his opening remarks suggested further examination of how SASEC can assist SAARC in furthering regional cooperation in South Asia. 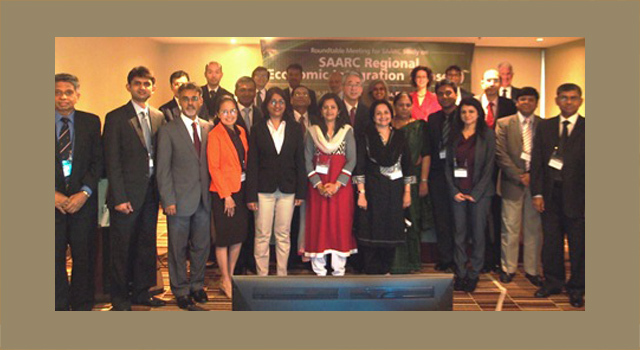 SAARC representatives, South Asia policy experts, and ADB staff chaired the sessions. Discussants of sessions included representatives from academia, leading experts and researchers in South Asia and officials from international organizations. ADB and SAARC Secretariat arranged and facilitated the event. ADB financed the Roundtable Meeting.